LAFAYETTE, Louisiana, October 13, 2011 (ENS) – Pelican Refining Company pleaded guilty to felony violations of the Clean Air Act at its refinery in Lake Charles, Louisiana, and to obstruction of justice charges Wednesday in federal court in Lafayette. If the court sentences according to the terms in the plea agreement, Pelican will pay $12 million in criminal penalties, the largest criminal fine ever imposed in Louisiana for violations of the Clean Air Act. The fine includes $2 million in community service payments that will go toward environmental projects in Louisiana, including air pollution monitoring. Pelican would be banned from future refinery operations at Lake Charles unless it implements an environmental compliance plan, which includes external auditing by independent firms and oversight by a court appointed monitor. “Louisiana is the sportsman’s paradise, and this corporation seriously jeopardized our precious environment. The citizens of our community should be appalled by such blatant environmental crimes. Going forward, this refinery will not be able to operate unless it is in full compliance with the law,” said Stephanie Finley, U.S. Attorney for the Western District of Louisiana. In pleading guilty, officials of Houston-based Pelican admitted that the company had violated numerous aspects of its permit to operate. Pelican admitted that there was no company budget for environmental compliance, no environmental department and no environmental manager. 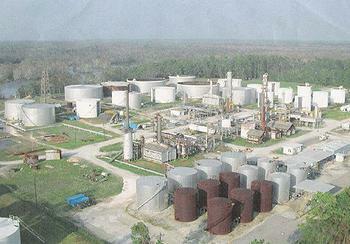 In order to comply with a permit issued under the Clean Air Act, the refinery was required to use certain pollution prevention equipment, but that equipment was either not functioning, poorly maintained, improperly installed, improperly placed into service and/or improperly calibrated, company officials admitted. It was a routine practice for over a year to use an emergency flare gun to re-light the flare tower at the refinery which was designed to burn off toxic gases and provide for the safe combustion of potentially explosive chemicals. Because the pilot light was not functioning properly, employees would take turns trying to shoot the flare gun to relight the explosive gases. Sour crude oil was stored in a tank that was not properly placed into service and remained in the tank after the roof sank. A caustic scrubber designed to remove hydrogen sulfide from emissions was bypassed, and a continuous emission monitoring system designed to measure the hydrogen sulfide levels in refinery emissions was not working properly. The violations were discovered during a March 2006 inspection by the Louisiana Department of Environmental Quality and the U.S. EPA, which identified numerous unsafe operating conditions. “This case illustrates the level of cooperation between the investigative resources within our state and federal law enforcement partners,” said Colonel Mike Edmonson, Louisiana State Police Superintendent. Pelican also pleaded guilty to obstruction of justice for submitting materially false deviation reports to LDEQ, the agency that administers the federal Clean Air Act in Louisiana. Byron Hamilton, the Pelican vice president who oversaw operations at the Lake Charles refinery since 2005 from an office in Houston pleaded guilty on July 6, to negligently placing persons in imminent danger of death and serious bodily injury as a result of negligent releases at the refinery. Hamilton faces up to one year in prison and a $200,000 fine for each of the two Clean Air Act counts.